BRAND NEW METAL GARDEN SHED IN 5 DIFFERENT SIZES and DESIGN with FREE BASE. This Electro galvanised metal shed provides a strong secure storage solution at a very favourable price. Double-baked-on enamel finish for durability. The shed has 2 doors which have deep runners entry ramp for opening and closing. A base is provided to ensure the shed sits on an even surface The base is a galvanised steel framework that. The shed as main photo 2. Please note base boards not included. You always have the option not to use the base framework and set up shed directly onto the ground. The dimensions are taken from the outside , so the inside size of the shed is 6 smaller (1/2 foot smaller in width and length). The shed will take 2 people with VERY GOOD DIY capability a whole day to set up. Brand New, boxed and includes VAT in the final price. Includes a FREE galvanised steel floor/base structure (boards not supplied) panels marked as W's. Deep-track doors on large glides for smooth sliding operation. Protected by double-baked-on enamel finish for durability. Normally takes 2 people with VERY GOOD DIY capability a whole day, gloves must be worn during assembly. 2 internal sliding doors (door position a below). Steel frame thickness 0.6mm body thickness is 0.25mm. Strong entry and exit ramp across door opening. Please note if the base is used the internal height is reduced by the height of the base which is 6cms high - internal height of the 8x6 is 5ft 10 or 5ft 9 ½ with the base used. (this measurement is at the highest point) the side wall are about 5ft high. The door can be locked with a padlock through the door handles. All the sheds will have a cream chasing around the door. Please note the goods may be subject to minor marking due to being flat packed in a box. We will do this upon photographic evidence. Care has been taken in terms of measurement and dimensions are an approximate, we. Disclaim all warranties, express or implied, as to the accuracy of the dimension information. Sale is for the shed and base only, no props like toolbox included in the sale. Size 6ft x 4ft and the 8ft x4ft has a Pent roof. 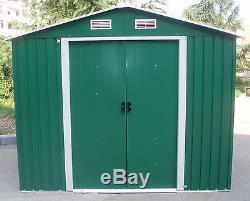 On this shed and all businesses that sells metal sheds, the dimensions are approximate and are taken from the outermost measurement roof overlap(similar to the roof on a house), the. Will be about half a foot less (about 6 inches less). Example 8ft x4ft shed (this is outer measurement) the internal measurements are 6" less, so the internal measurements are 7ft 6" wide by 3ft 6 deep. Also from past customer experience. Pleae choose a shed the next size up, as it does not take long before the shed is full, and once the shed is set up it can look quite small when you compare it to a room in the house. Please note all measurement are approximate. Size 6ft x 4ft - Pent roof. Height 1800 x Width 1800 x Depth 1200mm - Weight 48 kgs over 2 boxes - door on the 6 foot side. Size 8ft x 4ft - Pent roof. Height 1810 x Width 2400 x Depth 1200mm - Weight 52 kgs over 2 boxes - door on the 8 foot side. Height 1790 x Width 2400 x Depth 1800mm - Weight 76 kgs over 3 boxes - door on the 8 foot side. Height 1820 x Width 2400 x Depth 3000mm - Weight 103 kgs over 4 boxes - door on the 8 foot side. Height 1820 x Width 3000 x Depth 3600mm - Weight 114 kgs over 2 boxes - door on the 10 foot side. Please wait until you receive the shed before you book workmen to set up the shed. The item "New Metal Garden Shed 6 X 4, 8 X 4, 8 X 6, 10 X 8 Garden Storage with free base" is in sale since Tuesday, September 27, 2016. This item is in the category "Garden & Patio\Garden Structures & Shade\Garden Sheds". The seller is "uk-trade-direct" and is located in Derby.